Menopause can be treated in a multitude of ways but while hormone treatments are popular, not every woman wants to take a prescription medication. Instead, some women will look to alternative treatments to improve women's health. One such treatment is acupuncture, which can help many different health issues, including menopause. If you are looking for a natural treatment that has a low propensity for side-effects, then acupuncture might be worth consideration. The general theory of acupuncture is based on the idea that there are patterns of energy flow, known as Qi, that exist through the body. These patterns of energy are considered vital for life and good health. Therefore, any 'blockages' or problems with the flow are considered to be responsible for disease and ill health. 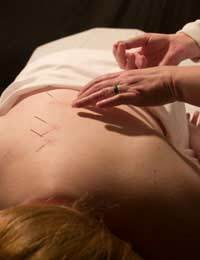 With acupuncture, different techniques are used to stimulate points at the skin and facilitate the overall healing of the body. There are various approaches to acupuncture but the most studied and commonly employed one involves stimulation of acupuncture points by penetrating the skin with very fine, metal needles. These are manipulated manually or via electrical stimulation. Acupuncture has long been known for its pain-relieving characteristics. It can, however, also treat hormonal problems at virtually every stage in a woman's life. For women who are experiencing the menopausal transition, this is welcome news. Not only can acupuncture handle their menstrual problems and pregnancy challenges during their younger years, but it can later provide relief from menopause symptoms. While the research around acupuncture is not conclusive and is still somewhat controversial in terms of the effectiveness of acupuncture, many people and professionals in medicine support the use of acupuncture. For women who are undergoing the menopausal transition, it is believed that acupuncture can aid the body's own adaptive changes to hormones and help relieve menopause symptoms through the use of needles at special points along the body. Typically, an acupuncturist will speak at length with a woman about her specific menopause symptoms, diet, lifestyle and her overall health. Then, a treatment plan is formulated – typically lasting from five to eight sessions. Some women find an improved sense of well-being after an acupuncture treatment. Others feel quite sleepy and find that acupuncture helps to ease their insomnia that has been occurring as part of their menopause symptoms. Still other women notice that their hot flushes are improved. Although the idea of needles can be intimidating, most women will find the treatment to be relaxing rather than painful or distressing. Although hormonal approaches are an important and beneficial treatment for some women, others do not like this common treatment that is dominant in Western medicine. HRT comes with a range of side-effects including an increased risk of stroke and certain cancers. Still, acupuncture has not been evaluated in the same stringent and detailed way that HRT has been assessed, which makes it difficult to compare the two treatments. At the same time, if you are quite sure that HRT is not right for you, whether those reasons are personal ones or related to risk factors explained by your doctor, then acupuncture does offer the potential for relief – with a low profile of side-effects on women's health, if any. What Makes Acupuncture a Different Menopause Treatment for Women's Health? As mentioned, acupuncture is based on the Chinese model of medicine and is quite different from Western medicine. Rather than approaching menopause as a disease that needs to be 'fixed,' acupuncture in China focuses on regulating the body and restoring balance. In China, the premise is that by doing so, menopause symptoms can gradually be eased and healed. When seeking out a professional acupuncturist, it is important to ensure that the acupuncturist is licensed and certified. Sterilising procedures should be used and more often than not, your acupuncturist will likely use disposable needles. If you are uncomfortable with the idea of needles, an acupuncturist may provide alternatives such as herbal methods, magnetic needles and ear cups. These are thought to provide similar results although are not considered as effective as acupuncture that utilises needles. Whatever path you take to treating your menopause symptoms, you can be relieved to know that you have many options, particularly alternative ones such as acupuncture. Hopefully, you will find a qualified acupuncturist who can listen to your concerns about menopause symptoms and begin a treatment plan that provides effective relief.